Images of Defiance: South African Resistance Posters of the 1980s tells the story of political posters in the 1980s, using 327 images of posters that formed the initial body of the SAHA poster collection (AL2446). 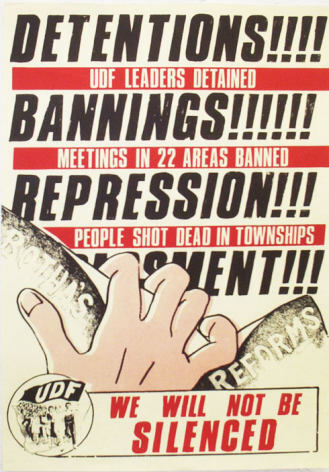 Many of these posters were produced by UDF affiliates, trade unions, and student groups, often as part of various poster-making initiatives, such as the Community Arts Project (CAP) in Cape Town, and the Screen Training Project (STP) in Johannesburg. 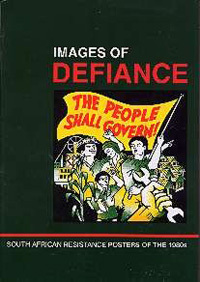 Written by the Posterbook Collective, comprising postermakers Emilia Potenza, Marlene Powell, Charlotte Schaer, Judy Seidman and Maurice Smithers, and originally published by Ravan Press in 1991, Images of Defiance was reprinted by STE Publishers in August 2004 (in cooperation with the City of Johannesburg). SAHA is working on a commemorative anniversary edition of Images of Defiance with a new chapter on post-1994 struggle posters, and an accompanying classroom guide. "It is very encouraging, especially to people of my generation, to know that the ideas for which many of us have sacrificed are very much alive and embodied in this collection of posters." "These posters embody the 'perceptions, realities and demands of the people that produced them.' This is what makes this book an invaluable cultural document." "Images of Defiance is an extraordinarily moving and valuable work... the images summon forth memories of the spirit that triumphed. It is an honour to see it captured in this way: burgeoning and indominitable"
"...can any poster be art, and any squeegee wielder with strong political conviction be artist? [IMAGES OF DEFIANCE] opens up many debates, pitting visual awareness against the realities of our country's identity ... this book is important and with appropriate readership, it has the potential to attain the recognition it deserves and be put to use in an appropriate way."